Maxwell windlass mounted in the anchor locker lid of my Sadler 34. 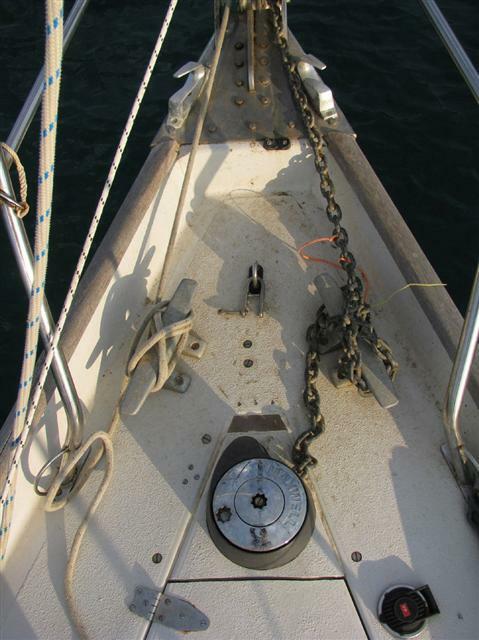 With any windlass it is important that the fall of the chain is as long as possible to avoid the need for frequent clearing of the pile when hauling the chain. 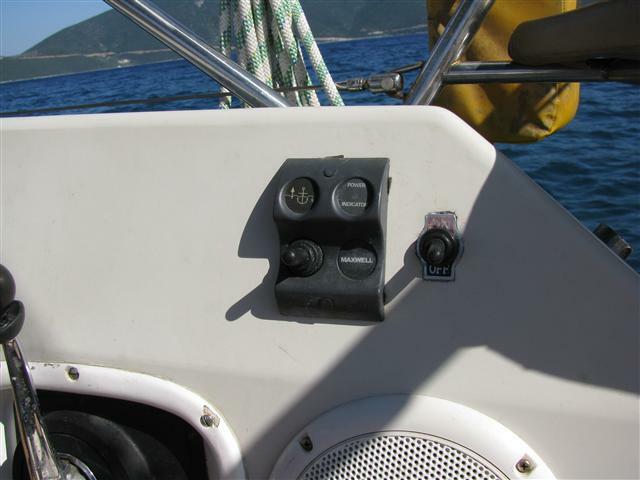 On a Sadler 34 and many other boats the anchor locker is immediately beneath the locker lid. To overcome this problem I cut the lid, strengthened it with plywood and mounted the windlass on it. The plywood used was 20 mm thick and extends well around the locker lid. The bolts holding it in place can be seen in the photograph, six in all, two each side at the top and bottom edges of the lid and two well forward, replacing a U-bolt that was there previously. The slight curvature of the cut lid was taken up with a shaped piece of plywood. The whole assembly was made up with Sikaflex 291. The windlass is powered from the domestic batteries aft, via 25mm2 welding cable. The flexibility of this type of cable makes threading it through the restricted passages of a Sadler somewhat easier. The windlass can be controlled either from foot switches on the foredeck, one visible in the photograph above, or from the switch that came with the windlass, mounted close to the engine controls in the cockpit. This has proved to be the ideal location for stern-to berthing in Greece. I can control the position of the boat precisely, allowing the crew to step ashore from the stern platform with the warps. 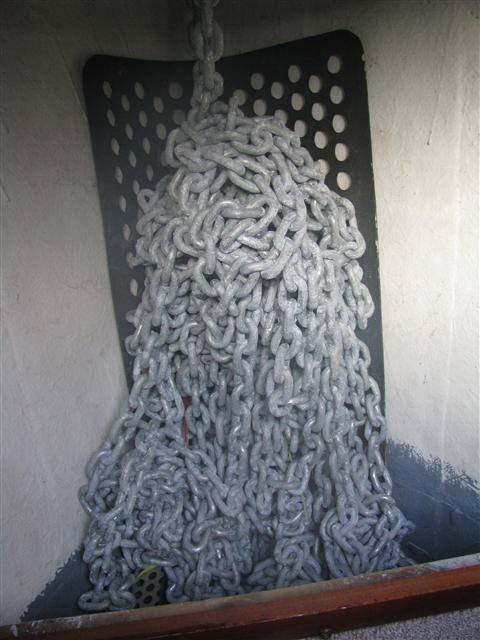 This spectacular chain pile was found in my motorsailer. The chain is freshly galvanised and had been laid out on the pontoon for length marking. When I reloaded it to the locker it was quicker to do so by hand than using my small windlass. This was the result.